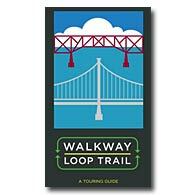 Download this brochure (PDF, 780K) for a map of the Walkway Loop Trail along with detailed descriptions of nearby parks and attractions. In addition to making a major financial contribution to the construction of the new walkway, Scenic Hudson also spearheaded the creation of the Walkway Loop Trail, a guided walking tour connecting the new park with other nearby parks and attractions. Crossing Walkway Over The Hudson State Historic Park and the Mid-Hudson Bridge, this 3.6-mile loop offers thrilling river views and connects riverside parks, cultural attractions and historic points of interest on the Poughkeepsie and Highland waterfronts. Additional links provide easy access to 2.5 miles of nature trails in Franny Reese State Park as well as miles of rail trails in Ulster and Dutchess Counties.